remain legendary; fortunately, we had the good sense to record and transcribe her assortment of recipes and favorite dishes while she was still with us, now a treasured family legacy. My mother, Mary Adelia, is certainly competent in the kitchen. But her older sister, Patti Bryant, my aunt, not only favors Mom in her looks (increasingly so, with the passage of time), but she also had more time with Mom in the kitchen during her formative cooking years, and absorbed the nuances. She’s the true bridge to the family’s culinary heritage. But times does fly. A few weeks ago, all the first cousins and their broods gathered at my aunt Patti’s and uncle Bill’s house in Jackson, TN, to celebrate their 80th birthdays (as well as their 59th wedding anniversary). For Patti, 80 is the new 65 — she’s as active and engaging as ever. And while she got the night off from cooking when we gathered at her place on a Saturday night to celebrate, she had baked two Buttermilk pies, a family favorite. 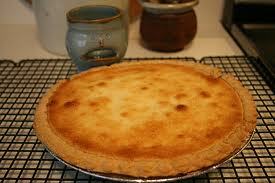 If you’ve never had it, Buttermilk pie is a custard-type dessert similar to that southern icon, Chess pie. But owing to the buttermilk, its texture is creamier and less dense than the traditional Chess pie, and it’s also a tad less sweet. The rich yellow-gold custard filling turns golden brown on top, and is a toothsome contrast to a crunchy pie crust. Doesn’t get much better (and great cold at breakfast)! The recipe above came straight out of Patti’s recipe box. Like many of the recipes derived from Mom, my great aunts and others from that generation, the directions are minimal — they assume baking acumen (on your part). It also calls for a stick of margarine, which might give some pause. Alternatively, you could substitute a stick of unsalted butter, along with a pinch of salt (as margarine contains some salt). Just realize the pie will taste richer. 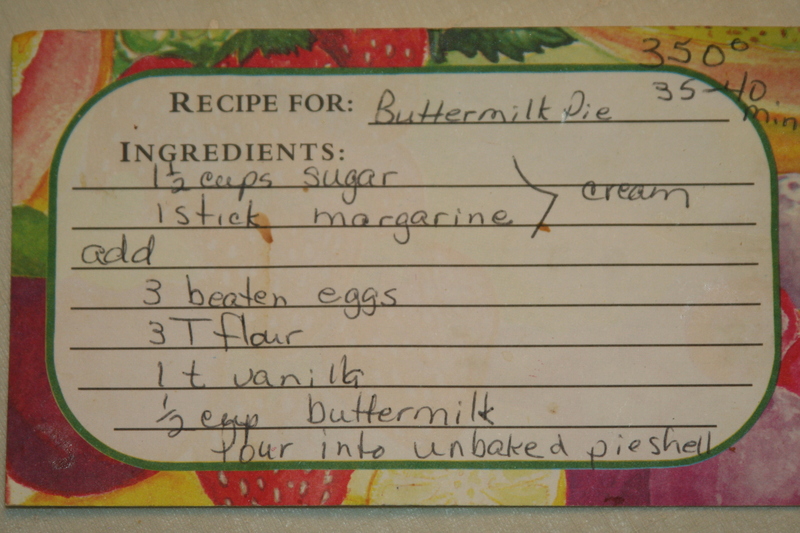 You add and combine the ingredients in the order written, and it’s essential that the buttermilk is added last, and that the filling is not over-mixed. Crust is another matter. Either buy an organic pre-made, uncooked pie shell, or make your own pie dough, aiming for a thinner, flaky crust. 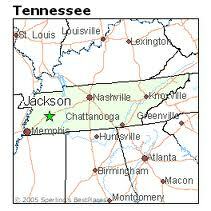 This entry was posted in Food, Home Baking, Travel and tagged Chess pie, heirloom recipes, Jackson TN, scratch baking, southern buttermilk pie, West Tennessee. Bookmark the permalink.